Watson - the Next Professor? This book presents an excellent and compelling account of the current landscape of modern universities and higher education. 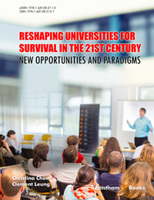 It provides an impartial, comprehensive view of the challenges which have affected universities in the last few decades. Dr Chow and Professor Leung clearly explain these challenges surrounding higher education systems in the developed world. The authors have a real and intimate understanding of the problems facing our modern universities, as well as their historical context. From the globalisation of finance and human resource to the disruptive innovation of technology transfer and digital revolution, they elucidate how these converging trends pose critical challenges for universities. Factors such as neoliberalism, marketisation and global competition undermine the monopoly previously enjoyed by esteemed universities. The emergence of disruptive technology and the current attitude of national governments towards university funding threaten the survival of this centuries-old tradition of higher education. Tracing the roots of university missions from the Middle Ages to the present day, the book looks at how the dominance of marketisation, global competition, and neoliberalism collide with the traditional idea of universities. It analyses the impact of global trends on universities in the 21st century, such as university rankings, competition for funding, and the threat and opportunities of new entrants into the sector. While the book explains the problems facing global higher education, it also contributes some valuable suggestions which universities can take to achieve distinction and success in the 21st century. Written in clear, easy-to-understand language, this book is a must-read for anyone who studies or works in the higher education sector. Every university wants to be world-class. In this knowledge-driven global economy, every nation wants to have the top-ranked universities in the world. Every parent wants to send their child to a top university. And most people want to have a good university degree. Why do universities have such an impact on our lives – and can they continue to exert such influence? What is the role of universities in the 21st century? Universities are facing unprecedented challenges in the 21st century. The international landscape of higher education is undergoing profound changes. These ancient institutions which represent the ultimate manifestation of human civilization are now confronted with dramatic changes as a result of globalisation, the knowledge economy and rapid technological advances. The traditional role of the university is forced to transform to meet these new expectations and challenges. In 1997, one of the pioneers of modern management predicted that "thirty years from now, the big university campuses will be relics. Universities won't survive.” As we head into 2017, that threat has not receded. In 2012, an Ernst & Young report repeated the warning that the current university model was not viable. Once revered as ivory towers which reigned supreme over their students, today’s universities are forced to regard their students as consumers and customers. While the traditional university could pursue knowledge for its own sake, nowadays it must answer to the demands of its funding masters. Universities are now expected to be responsive and innovative, rather than rocks of stability and esteem. Governments expect universities to generate not only intellectual capital, but economic and social capital as well. Universities are regarded as engines of innovation and required to contribute to the national economy and international standing of their countries. Within the cloisters of universities, the current climate is tumultuous. Mass redundancies and department closures have become routine. Mistrust is rampant, and there is widespread interference from governments and funding bodies. Such unrests are occurring in many countries - from Australia (Evans 2014), Finland (Sulkunen 2010), France (Lichfield 2015), Japan (ICEF Monitor 2015), Germany (Keim & Keim 2010), United Kingdom (Boffey 2013; Morgan 2015; Murray 2014), to United States (Economist 2012; Hutner & Mohamed 2013; Kingkade 2012; Kuttner 2013; Sager 2014; Selingo 2013). Universities are buffeted by uncertainty and the rapidity of change: they are torn between market forces and increasing public expectations and accountability. They struggle with declining funding and increased cost scrutiny. Quality assurance and auditing exercises are relentless. Challenged on multiple fronts, universities are faced with conflicting agendas. They are expected to develop world-class reputations in research while teaching increasing numbers of students. They are required to serve as engines of economic development while maintaining comprehensive scholarly profiles. This book examines the three overriding trends which impose far-reaching effects on universities in the 21st century. They are: the knowledge economy (an innovation-driven economy based on knowledge as a commodity); the globalisation of financial and labour markets; and the digital revolution. These converging trends pose critical challenges for universities, who must meet the demands of new research and learning imperatives, respond to new forms of competition, and explore new modes of operation. The rise of the knowledge economy erodes the supremacy previously enjoyed by universities and necessitates new methods of knowledge transfer and engagement. Universities are driven by globalisation: they are in competition and collaboration with other institutions and nations. Technological advances oblige universities to employ new ways of interacting and serving their students and community. Tracing the roots of university missions from the Middle Ages to the present day, this book looks at how the dominance of marketisation, competition, and neoliberalism collide with the traditional idea of universities. It analyses the impact of global trends on universities in the 21st century. Global competition between universities has become unrelenting, with contests such as university rankings, competition for funding, and the threat of new entrants into the market. The international expansion of the knowledge industry has eroded the monopolistic position previously enjoyed by universities. The liberalisation of higher education services under the World Trade Organization has radically changed the relation between the state and its public universities. Universities are increasingly regarded as service providers, and they face competition from new types of suppliers. Rapid advances in information and communication technologies transform teaching and learning, fundamentally altering the way that universities offer and deliver programs. Universities are faced with growing expectations to deliver services, content and media to mobile and personal devices in order to meet students’ expectations of ‘anytime, anywhere’ access. In addition, the trend of corporatisation has resulted in university management imposing greater controls over academic work and behaviour, to the extent that academic freedom is threatened. The age-old principle of institutional autonomy has become tenuous, since governments closely steer universities through performance funding, research priorities and funding criteria, all in the name of accountability. This book provides an impartial insight into the challenges faced by higher education in the 21st century. It also suggests possible paths which universities might take to survive. There had been very few books written about universities. Most books on universities were very specialised, written in technical or esoteric jargons, focused narrowly on specific academic matters or had a particular political agenda in mind. That is what made Reshaping Universities for Survival in the 21st Century: New Opportunities and Paradigms by Chow and Leung so different. It was written for both the general public and university insiders, providing the readers a big-picture view of the university environment. It gave an overview of the core missions of universities from past to present, and explained how the traditional university had become commercialised, marketised and corporatised. Backed by substantive references, the book presented a comprehensive and compelling account of the current landscape of our universities. The writing was impartial and balanced, clearly describing the challenges which had affected universities in the last few decades. I have personally found the book very informative. While some of the terminologies were vaguely familiar to the academic communities, I had no idea how many of the phenomena came about. The truth was that universities were no longer revered as ivory towers as they once were. The book opened dramatically with the title “Skyfall: Universities in Crisis?” followed with headlines predicting the downfall of universities. For example, Peter Drucker, one of the founders of modern management theory and practice, had argued that, just about a decade from now (2027), “the big university campuses will be relics. “Universities won’t survive.” A report from the UK Institute of Public Policy Research informed us that the university model was broken: “Unless universities are transformed, an avalanche will sweep the system away.” Again, the Economist warned that “a cost crisis, changing labour markets and new technology will turn an old institution on its head”. Strangely enough, there had been no responses whatsoever from the university communities countering such claims until this book. The authors boldly laid out the problems right from the start: inadequate funding by governments; marketisation of the higher education system; global competition; loss of monopoly; disruptive technology; rise of the MOOCS; escalating costs in university education; ballooning student debts; and falling “wage premium” for graduates. The authors demonstrated a real understanding of the challenges. From the globalisation of finance and human resource to the disruptive digital revolution, they elucidated how these converging trends posed critical challenges for universities. Factors such as neoliberalism, marketisation and global competition undermined the monopoly previously enjoyed by universities. The emergence of disruptive technology and the current attitude of national governments towards university funding threatened the survival of this centuries-old tradition of higher education. The book was written in easy-to-understand language but some non-academic readers would find the constant references exasperating, though this is a strict requirement in serious writing in order to validate the authors’ claims by referring to documented evidence. The book consisted of six chapters. The first chapter detailed the global challenges which have affected universities in the last few decades – from globalisation to the rise of knowledge economy and the digital revolution. It explained how ideologies such as neoliberalism collided with the traditional idea of universities. It examined the impact of global trends on universities in the 21st century, such as university rankings, competition for funding, corporatisation, and the threat of new entrants into the market. The chapter also provided a snapshot of the changing landscape in higher education including the exponential growth in student enrollments, and changing societal expectations. Chapter Two went into greater details signposted in Chapter One. It explained how the increasingly knowledge-driven global economy had made university education ever more important and the need for lifelong learning. It elaborated on how universities increased their student enrollments and expanded their global footprint. The readers were also able to gain an understanding of the unintended consequences such as escalating tuition fees, graduate unemployment and rising student debts, partly as a result of the trends of marketisation and competition. Chapter Three was devoted to international university rankings which would be of interest to many readers. It made comparison of the various ranking methodologies – ranking criteria, weightings, proxies for quality, choice of indicators, data sources, and use of surveys, and it questioned the validity of some of these measurements over a short timeframe to accurately measure university performance. Chapter Four had a title that was on every reader’s mind – Would Watson be the Next Professor? It gave details on the explosive increase in the creation of data in recent decades. While search engines helped to narrow down the right kind of knowledge on the internet, the ability to produce answers from them still required considerable human judgment. The chapter examined the possibility of developing an automatic system which would be able to answer questions, and so replace the role of the human lecturer. Even though the Massive Open Online Courses had the advantages of ubiquitous ‘anytime’ learning, they lacked the capability to fully replace the conventional physical lecture room with its face-to-face interaction and hands-on laboratory experiments. Chapter Five came to the nub of the book, academic capitalism, and the root of many of the universities’ problems. As students were increasingly viewed as customers, academic education was reduced to student satisfaction surveys, quality control, performance measures, quantification of student experience, and ranking and league tables. Commodification of education also led to standardisation, formulaic teaching, and turning intellectual rigour into customer service. At the same time, universities had embraced the market logic of growth, competition and commercial techniques in promoting and encouraging academic capitalism and entrepreneurship. As a result of declining public funding, universities engaged in market-like efforts to obtain external funds such as recruitment of more fee-paying students. However, the profit motive had become increasingly explicit and central in institutional strategy. Revenue became the priority, and top-down management had displaced academic self-governance. In the concluding chapter, the authors argued that the current university model is broken, but universities continued to use the ancient elite model for mass education in the 21st century. The authors offered some innovative advice of incorporating contemporary business strategies and technologies to reshape universities, such as Steve Jobs’ “staying focused, making sure functions are seamlessly integrated, and always innovating and advancing”. Other advice includes technology leadership; benefit from neuroscience research; getting into the top 10; expanding the global footprint. Importantly, the writers emphasised that universities had to create real value for students – equipping them with employable skills to be entrepreneurial, innovative, and adaptable in the volatile job market. Above all, universities should get leaner and more productive with administrative efficiency and flexible governance structure that encourages innovation. The authors argued powerfully that universities need to transform their old business model to meet the challenges of the 21st century. While many of the ideas were excellent and probably very effective, the book offered little details on how to execute these strategies. The truth is that universities are not short of good ideas. What they lack are will power and leadership that can help transform the culture – a culture that is innately skeptical about new ideas and change. From the faculty perspective, university leaders have so far failed miserably to provide the compelling case for change and this book has gone a long way to explaining this. Unfortunately, the authors had not delved deep enough to unearth the leadership issue which is critical if universities were to transform into 21st century learning institutions. Overall, the book has made an invaluable contribution to the current debate surrounding university funding. At the beginning of the 21st century, it is timely to think about the real purpose of universities and their place in history. This book is a must-read for anyone who studies or works in the higher education sector.